Jackie Sourek says she never pictured herself on a farm. But her husband Pete had fond memories of his time on his great-grandfather's dairy farm, so they secured four acres in Rossville. On Jameson Woods Farm, the Soureks have 30 chickens, 15 ducks, and 9 Nigerian Dwarf goats. They got the goats to help clear the land. They chose that breed because they are easier to manage and the goats' milk is consumed by Jackie and Pete, their two sons, their dogs, and the chickens. "We fell in love with them," Sourek says of the goats. "They're almost like dogs. 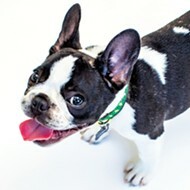 They have sweet little personalities." 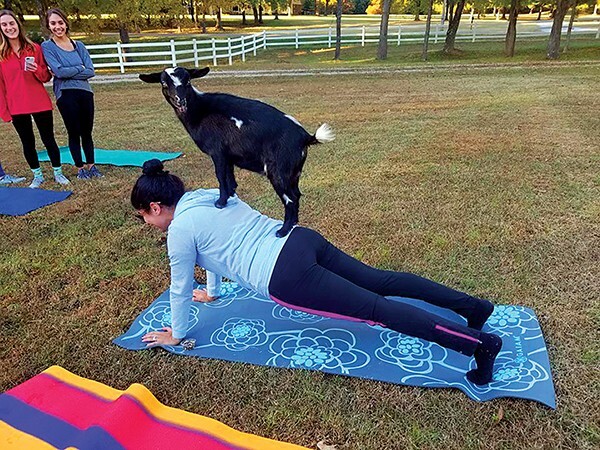 The goat yoga craze began in Oregon about a year ago. Sourek says people began sending her stories about it. She thought, "That seems crazy. Nobody would do that." But then she thought, "The goats do love attention. ..." So they held an experimental class last spring led by Becca Jones. During a typical class, which is open to all levels, Jones gets the students set and she begins the class. About 30 or 40 minutes in, the goats are released. "It gets pretty chaotic once they come around," says Sourek. The goats aren't allowed to climb on the students during class. But after class, they are. Post-class is also a good time for goat-snuggling. 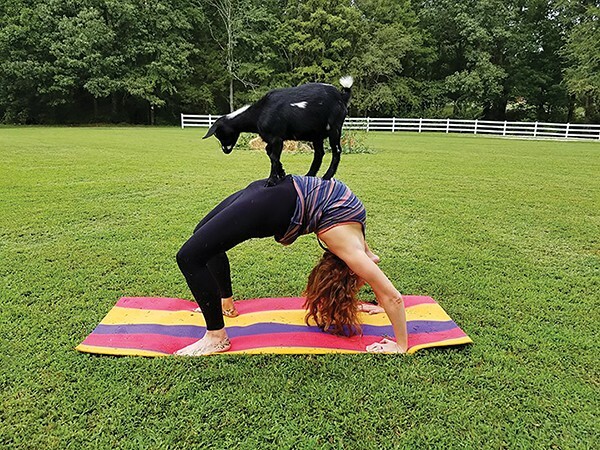 Hanging out with goats, Sourek says, is "therapeutic, relaxing, and light-hearted."